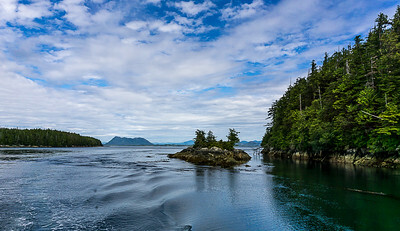 This collection of photos was taken during a fishing/boating trip about 145K (95m) south of Prince Rupert, B.C. VIEWING OPTIONS: To enlarge images, click on either the featured image below or one of the thumbnail images. For full-screen images, view in slideshow mode. For the EXIF, click beneath each photo. Unfortunately, in this gallery, the time is misstated by 17 hours which needs to be subtracted from the time shown. Arriving in Prince Rupert by air, one lands at the Digby Island Airport from which a short ferry trip to P.R. is taken. This is Venn Passage. 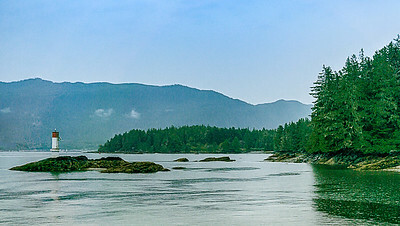 It might be observed that this region of the north BC coast is ocean, lakes, rivers, mountains, islands and pine trees. 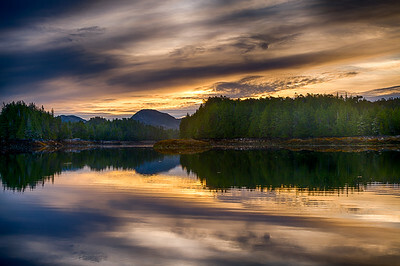 I was surprised to learn that Prince Rupert is also on an island. 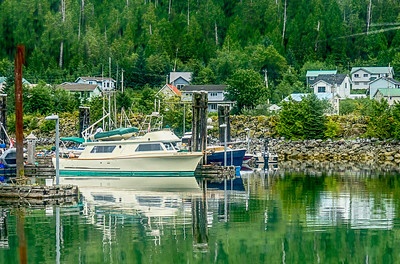 This is my brother's boat, dockside in the First Nations village of Hartley Bay. I spent a wonderful five days aboard the San Simone with my brother and his wife - truly a highlight of my life. MacDonald Bay, looking east. We caught our limit of Dungeness Crabs in this location enjoying the freshest crabs one can eat along with some good white wine and great conversation. One other boat anchored in this bay that night. Looking west towards the entrance into this secure anchorage. Another glorious sunset. The finest crab-feast I've ever enjoyed was Dungeness Crabs from the bay. Coast Islands - Fin Island on the right. Lachkul-jeets Indian Reserve No. 6 is located on the east side of the island at 53°16′00″N 129°19′00″W, 1.60 ha. (4.0 acres). 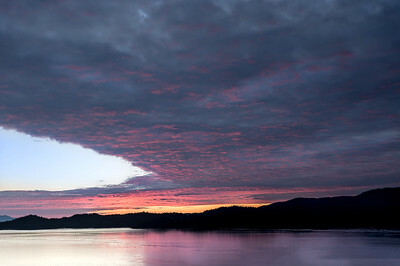 It is one of the many reserves of the Hartley Bay First Nations Band of the Gitga'ata group of Tsimshian. The wake of a displacement cruiser is a gentle ripple on the water's surface and white foam created by the propeller and movement of the boat. 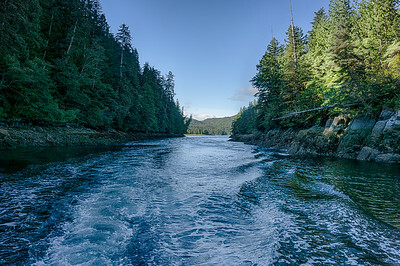 This narrow passage leads from Grenville Channel between Pitt and Farrant Islands. This is a special place for the Bartons. My brother has dubbed the secret bay this leads to as "Barton Bay" for reason best known to our family. This passage provides access to what is now an abandoned radar post build by the US government during the Cold War. When is comes to technology, you can count on one thing, it's cannibalistic. A quiet inlet just a few hundred meters east of the open Pacific Ocean. Money Point at the south end of Hawksbury Island has proved to be a productive fishing spot for me. I caught my first Salmon here again this year. The American flag is mounted at the stern of San Simone, my brother's American registered motor cruiser. 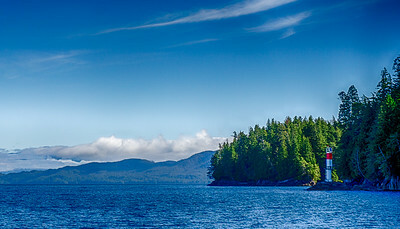 Located on the north-west point of Gil Island. 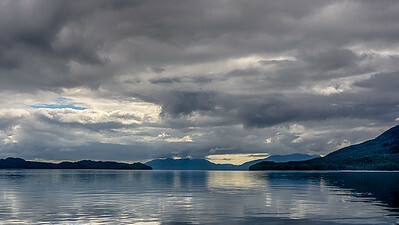 The predominantly blue tint of this seascape, cloudy overcast and glassy water creates an almost etherial scene. I'm informed that Captain Vancouver anchored here. 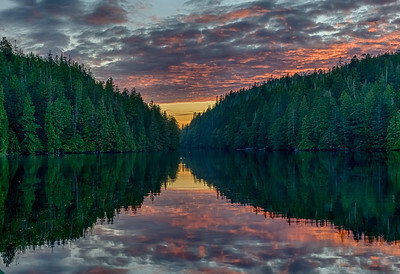 This photo was taken at 5:55am, 10/08/15 from the stern deck of our boat, at anchor in the Betteridge Archipelago. This shot faces east. 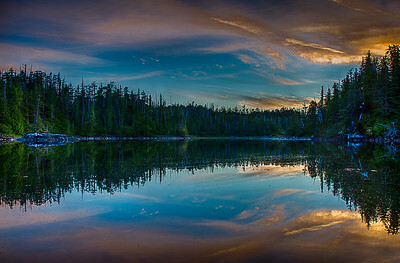 The only sound was the haunting cry of a pair of loons; truly a sign of being in a remote place. See previous, taken from the same location, but facing more northerly. Yes, these colours are very real. Enlarge the photo and you will see exactly what I saw - a pristine ocean scene yet unspoilt by man's hands. This is known as Squally Channel with Pitt Island in the distance. At the moment, there is a war of words being waged by those who would use this region for moving petroleum products aboard giant ocean-going tankers to China. It's an ethical dilemma, economic progress vs. environment. 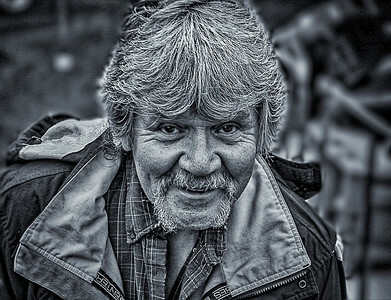 Always a helping hand, Wally helps with loading and unloading people and cargo from boats and planes that come into the Hartley Bay village. 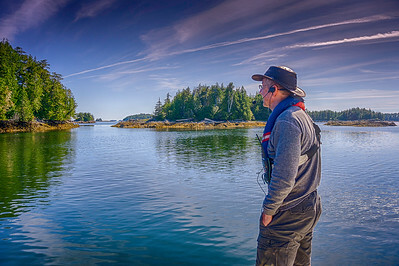 He is a member of the the Hartley Bay Indian Band, also known as the Hartley Bay First Nation, Hartley Bay Band, Gitga'at Nation and Gitga'at First Nation. Word has it that Wally is particularly proud of his carefully coiffured hair. Who can blame him? While the rest of the crew were still sleeping, I arose before sunrise to this tranquil setting. 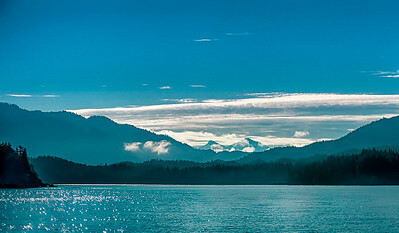 I took two shots of this setting as the boat gently turned at anchor. 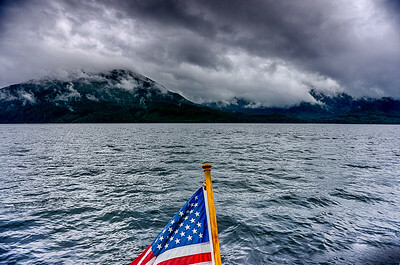 This shot includes San Simone's flag, being a boat registered in Dripping Springs, Tx, USA. 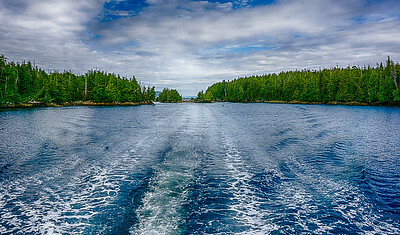 This beautiful pass runs through the Estevan Group of Islands between Trutch, Prior, Tennant, Bernard and Nichol Islands. 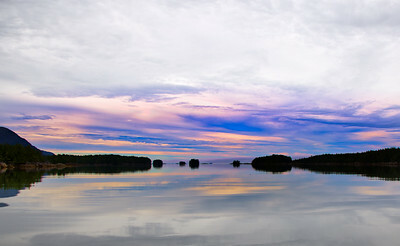 The Estevan Group is made up of literally hundreds of Islands and Islets. I believe one could limit their boating to just this group of islands an never exhaust the photo opportunities they represent. Boating miles away from help is a very serious responsibility. I was alway confident in my brother's seamanship and had no difficulty deferring to his leadership at sea. Harmony at sea makes for happy cruising. 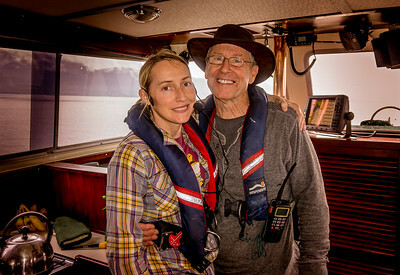 Bryon and Brandee, also known as the "B-Team" were the perfect hosts for a great week of boating and fishing. This shot shows the eastern approaches to Langley Pass. 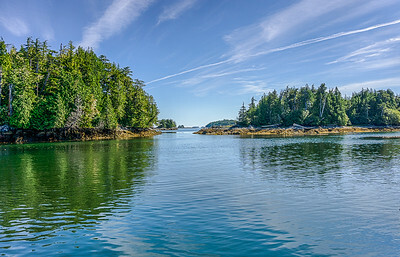 It's a beautiful, seldom visited place, and leads to Ethelda Bay, (where the old NORAD DEW Line base was) and then an exit into the famous Hecate Strait. 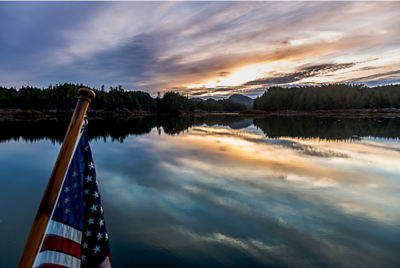 This photo was taken at 5:55am, 10/08/15 from the stern deck of our boat, at anchor in the Betteridge Archipelago. This shot faces east. The only sound was the haunting cry of a pair of loons; truly a sign of being in a remote place.